Cleaning up vomit is a fact of life if you're lucky enough to have a dog in your life. 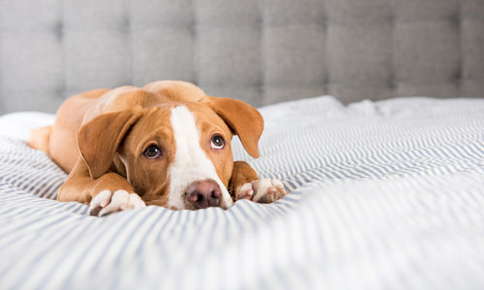 Although all dogs vomit from time to time, it's important to distinguish between simple upset stomachs and more serious conditions that can cause vomiting. Some people use "regurgitation" and "vomiting" interchangeably, but the words don't mean the same thing. Vomiting occurs when digested food is forcefully expelled from your dog's stomach. Regurgitated food never makes it the stomach. It becomes lodged in the esophagus until your dog manages to deposit it on your kitchen floor. You can often tell whether vomiting or regurgitation has occurred by taking a close look at the contents of your dog's digestive system. If the material is liquid, it's vomit. If it's fairly solid and composed of recognizable food, regurgitation has occurred. What Causes Vomiting and Regurgitation? Sampling the Trash. Eating foods found in the trash or even eating non-food items can cause vomiting. Food Changes. Have you recently changed the food you feed your pet? New foods may upset your pet's stomach and cause vomiting. Eating Chocolate. Chocolate contains theobromine, a substance that can cause death if your dog eats enough of it. Eating very small amounts of chocolate may only cause vomiting and diarrhea. If your dog eats any amount of chocolate, call our office for instructions. Ingesting Poisons. Poisons and toxins found in lawn care products, pesticides and other products can cause vomiting. Diseases and Illnesses. Your dog may vomit if he or she has a viral illness, bacterial infection, colitis, intestinal parasites, liver or kidney failure, pancreatitis or other conditions or diseases. Side effects from medications may also cause vomiting. Obstructions: Vomiting can be a sign that your dog has an obstruction in the gastrointestinal tract. Blockages can be caused by foreign objects, tumors, hernias, pyloric stenosis and other conditions. Bloat. If your dog has bloat, he or she may try to vomit, but may not be successful. Bloat is a life-threatening condition that occurs when the stomach twists and fills with gas. If the condition isn't diagnosed and treated quickly, breathing difficulties, stomach rupture or death can occur. Heatstroke. Heatstroke can cause vomiting, in addition to panting, drooling, reddened gums and low urine production. Pouring water over your pet can help, as long as the water is cool, not cold. After you cool down your pet, you'll need to take him or her to the veterinarian to make sure that there are no lasting effects from heatstroke. Megaesophagus. The condition occurs when the esophagus can't push food into the stomach because it's unable to contract normally. Megaesophagus can be present from birth or can be caused by a foreign object or certain diseases, such as autoimmune diseases, hypothyroidism or myasthenia gravis. Other Causes. Regurgitation can also occur if your dog has a throat abnormality, a disease that affects the muscles or nerves in the throat or esophagus, cancer or a hiatal hernia. When Should I Be Concerned About Vomiting? Treatment for vomiting is based on the cause. Removing foreign objects, treating accidental poisoning or treating underlying diseases can be helpful. Vomiting, regardless of the cause, may cause dehydration. During your pet's visit, he or she may give intravenous fluids to combat the effects of dehydration. The sudden onset of severe vomiting or vomiting that doesn't go away is always a reason for concern. If your dog displays any of the signs mentioned above, call our office as soon as possible. PetMD: Dog Vomiting – Why Is My Dog Throwing Up?